Washington area media representatives are invited to a special event for Girl Scouts celebrating women in aerospace, engineering, and science on Sunday, August 27, 2006 beginning at 2:00 pm at the Goddard Space Flight Center Visitor Center in Greenbelt, Md. Junior Cadet, Senior, and Studio2B Girl Scouts of the Girl Scouts of Central Maryland, Inc and Girl Scout Council of The Nation's Capital have been invited to participate in a wide range of exciting, aerospace-related activities that apply toward Girl Scout Merit badges before watching the televised launch of Space Shuttle Atlantis from Kennedy Space Center. Atlantis and her crew are scheduled to launch at 4:30 p.m. Eastern on the start of Mission STS-115, an eleven day flight to continue assembly of the International Space Station. 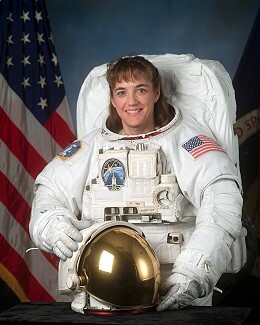 The Girl Scouts will have a special connection to this particular shuttle mission in that one member of Atlantis' crew, Astronaut Heidemarie Stefanyshyn-Piper, is a former member of the Plast Ukrainian Scouting Organization. The organization, while co-ed, promotes many of the same ideals as the Girl Scouts. NASA and the Girl Scouts of the USA are partners in a groundbreaking effort to inspire young women to pursue careers in science, technology and mathematics. NASA provides education materials and training to Girl Scout leaders, who help NASA fulfill its mission to "inspire the next generation of explorers." The Aug. 27 event is among the first of several exclusive events for Girl Scouts. I've been reading this blog and other similar posts and this'll be my career, I want to be a spaceman! But wait a minute: I'm a silly blogger, I am a bad student, I'm a boy (this'll be only for girls) and I've been having troubles with mathematics since my born-day! What can I do with my dream?